To keep your companion animals healthy, you should take them to your veterinarian at least once per year for a routine examination, often called a wellness exam. Since animals age at a much faster rate than humans, this would be equivalent to a physical examination by your personal physician every four to eight years. Middle-aged to senior pets should be examined twice a year, and puppies or kittens should receive at least three examinations in their first year of life. In order to get the best out of this veterinary visit, you should be prepared to answer questions about your pet’s lifestyle and routines, and you should ask your veterinarian questions about your pet’s examination findings. 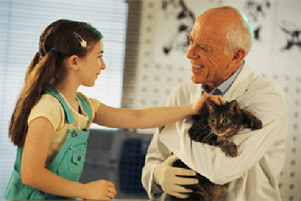 Make sure you also get advice on how to keep your pet as healthy as possible through preventive care. Does your pet go outdoors unsupervised? Does your pet drink from puddles or ponds? Does your pet swim in a pond, lake or river? Does your pet go into wooded areas? How much water does your pet drink on a daily basis? What brand and what quantity of food does your pet eat? How many treats or table scraps does your pet get on a daily basis? Does your pet ever cough, sneeze or vomit? What are your pet’s elimination habits like? Does your pet show any signs of pain, stiffness, or decreased activity? Talk to other family members who provide care for your pet before coming to the appointment, and make sure you answer these questions accurately. Don’t underestimate what table scraps you feed or anything else about how you care for your pet. Your veterinarian is there to help you to provide the best care for your pet and they can only do that if they know the facts. Is your pet’s weight normal or abnormal for its overall size and breed? What should your pet be eating? Nutrition is one of the most rapidly expanding areas of research in animals, and veterinarians are your best source for learning about the most recent recommendations for optimal nutrition. Were there any abnormal findings on the exam? If so, what are the next steps? What vaccines, heartworm prevention, flea control or tick control is recommended for your pet’s individual lifestyle? Are there any other problems that might pose a risk for your pet? Examples include risks associated with genetics (breed-specific problems), or risks for animals that are not spayed or neutered. How often should your pet have a wellness examination? This interval will change according to your animal’s breed and age, and your veterinarian will make specific recommendations based on findings from the current visit. Based on your individual circumstances, your veterinarian may recommend “wellness testing” that may include blood tests, urine tests, x-rays, blood pressure monitoring, or other diagnostic procedures. The purpose of wellness testing is to uncover subclinical or underlying problems in their early stages. Veterinarians are trained to interpret the results of wellness testing, along with the pet’s behavior, lifestyle and travel history, and results of the physical examination, and formulate the most appropriate treatment plan for the individual pet. Research has shown unequivocally that sharing your home with a pet can help keep you healthy by reducing stress in your life. However, if we choose to share our lives with companion animals, it becomes our duty to make sure that we provide them with the care they need to stay healthy and happy. In many cases, early detection and treatment of sub-clinical disease can lead to a longer and better life for the pets that we love and care for.